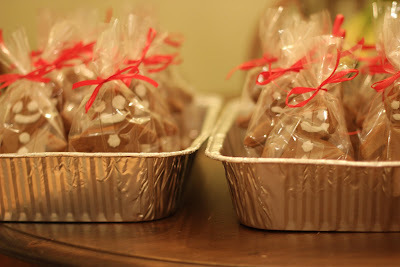 I made these gingerbread men for a bake sale recently. They turned out amazingly well, although I find that if you find your dough too sticky make sure you add a little more flour or your cookies will not cook well. This recipe is from Cooks Illustrated. The cookies can be stored in an airtight container for up to one week. 1. In food processor, process flour, sugar, baking soda, salt, cinnamon, ginger, and cloves together until combined about 10 seconds. Scatter butter pieces over flour mixture and process until mixture is sandy and resembles very fine meal about 15 seconds. With machine running, gradually add molasses and milk, process until dough is evenly moistened and forms soft mass, about 10 seconds. 2. Scrape dough onto counter; divide in half. Working with 1 portion of dough at a time, roll dough to even 1/4 inch thickness between 2 large sheets of parchment paper. Leaving dough sandwiched between parchment layers, stack on baking sheet and freeze until firm, 15 to 20 minutes (or refridgerate for at least 2 hours or overnight). 3. Adjust oven racks to upper middle and lower middle positions and heat oven to 350 degrees. Line 2 baking sheets with parchment paper. 4. Remove 1 dough sheet from freezer; place on counter. Peel off top parchment sheet and gently lay it back in place. Flip dough over; peel off and discard second parchment layer. Cut dough into 5-inch gingerbread men, transferring shapes to prepared sheets with tide metal spatula, spacing them from 3/4 inch apart.set scraps aside. Repeat with remaining dough until sheets are full.Bake cookies until set in centers and dough barely retains imprint with touch very gently with fingertip, 8-11 minutes, rotating sheets fron to back and top to bottom halfway through baking. Do not overbake. Cool cookies on sheets for 2 minutes, then remove with wide metal spatula to wire rack; cook to room temperature. 5. Gather scraps; repeat rolling, cutting, and baking in steps 2 and 4. Repeat with remaining dough until all dough is used. Decorate with icing.